Pop all of the ingredients into a blender and blend until smooth. Pour into your ice lolly moulds leaving a little room at the top. If you want to leave them at this stage, add your lolly sticks, fill to the top with the remaining mixture and pop into the freezer. However, if you fancy taking them to the next level (it's so worth it) then follow the next steps. Mix all the ingredients together in small bowl. If the mixture is a little too runny to handle, just pop it into the freezer for about 15 minutes to firm up a little. 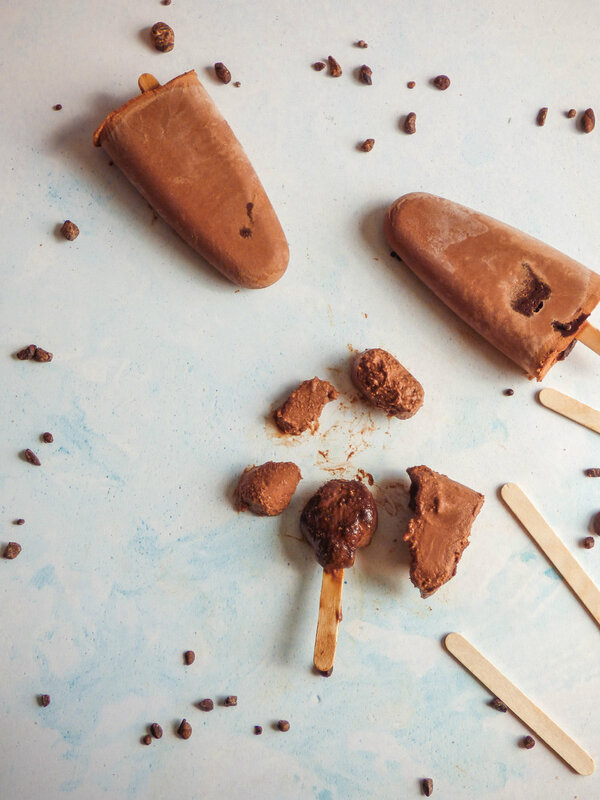 Then, wet your fingers and roll teaspoon sized amounts of the truffle mixture into a ball, mould the truffle around the top of the ice lolly stick. Then pop the truffle coated lolly stick into the ice lolly moulds. Fill up the moulds to the top with any of the remaining ice cream mixture. Pop into the freezer for a few hours to set.